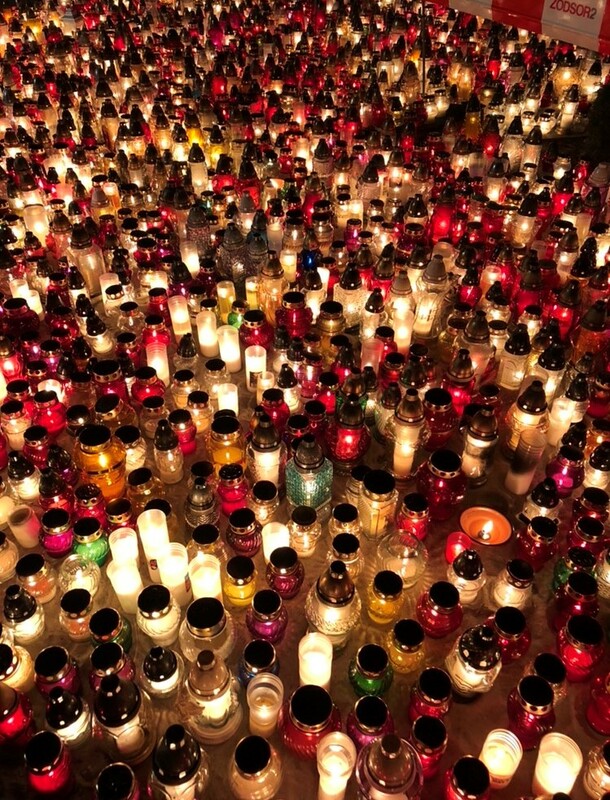 A sea of grave lanterns placed at Grabiszyński Cemetery for All Saints Day. 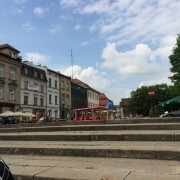 I had been in Poland for just over a month, when I suddenly found myself in the Poland I had always read about. Well, it never was called by the name Poland in those stories. It was just a place. Usually a dark place, with endless woods encroaching on the safety of a village. 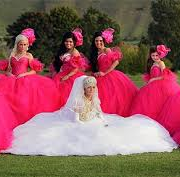 That is the Poland of Slavic folklore. A place where the ferocious witch Baba Yaga lives in her chicken-legged hut and the ghost lights błędne ogniki lead travelers off beaten paths, lured away by the temptation of an unexplained glow. As a temporary citizen of the all too real Poland, I did not have any ogniki to follow when I wanted to chase the lights on All Saints Day. The only gnomes that live in my version of this country are made of bronze. So, I took the E tram. It wasn’t a difficult journey. The city felt like it was bleeding away in the directions of the most prominent cemeteries; people coagulated in the places their families were laid to rest. Because, this was a celebration of those dead. The holiday, a mix of Catholic and pagan rituals, shuts down all of Poland for twenty-four hours of remembrance. When stepping off the tram and following the locals that seemed to know where they were going, I didn’t see the cemetery at first. Instead, I found an outdoor market; a mini, open-air version of the marketplaces I had already encountered all over Europe. Stalls were brimming with treasures, an unspoken call to the visitors to bring lanterns and chrysanthemums to decorate their ancestors’ final resting places. I should note that I am not afraid of graveyards. My family cultivates our own personal memory culture with the same relish that we do the recipes we’ve perfected for Christmas dinner. It’s my grandma’s job now to manage what we bring to the cemetery. She knows what to bring for who, and when to do it. My mom is learning. She follows her mother through the constellation of graves that mark my family, learning what order is to be followed. I’ll learn it too, someday. We inherit this job, in my family, just like we inherit the stories of the family members that were gone long before we arrived. 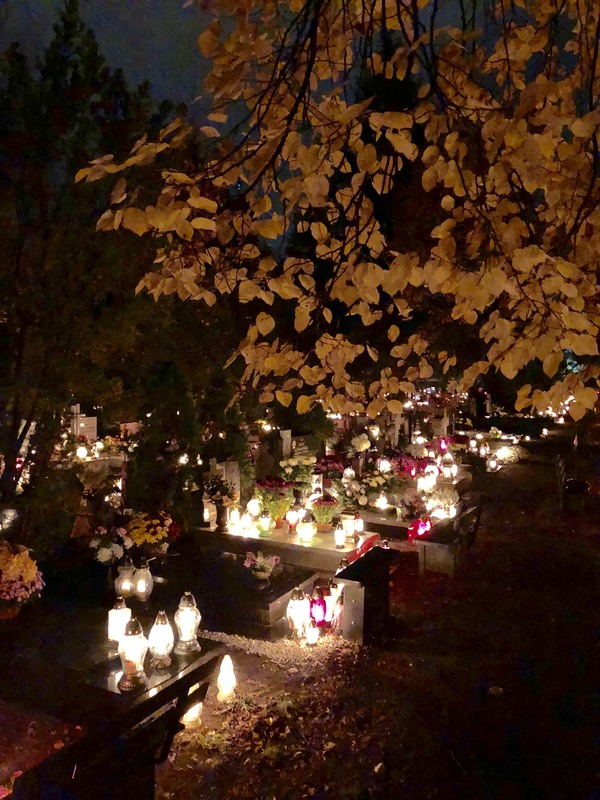 Grabiszyński Cemetery on All Saints Day. The cemetery is primarily for military persons and was extremely busy on this holiday night. 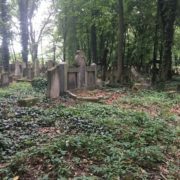 But, even all that ingrained experience of cemeteries did nothing to prepare me for Grabiszyński Cemetery, Wroclaw’s second largest communal graveyard, that night. There, I encountered the ogniki I had been seeking. The lights flickered between headstones instead of illuminating paths in folkloric forests. Every direction was a hypnotic mirage of dark silhouettes cast against the white and red glow of tiny glass lanterns. Most of those silhouettes were the markers of graves that had been there for roughly a half a century. But, a lot of them were the shapes of family members visiting their lost loved ones. This was a place, a night, where memory was not abstract. It was enacted. 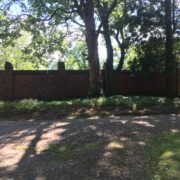 There did not appear to be a single grave in the entire place left dark. And, I couldn’t wait to tell my mom about it. 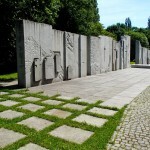 What is perhaps the youngest monument in Europe rests at the foot of Warsaw’s Palace of Culture. Rest may not be the most apt word for the assembly of lanterns and flowers and flags that surround the face of a man printed in greyscale, all collected in the shadow of that imposing building. But words have difficulty capturing this wound left in the heart of the city. I wouldn’t have known it had I stumbled on it alone. My foreigner’s ignorance of this country keeping me from understanding. But, I did not stumble on it alone. It arrived at the tail end of a three-hour walking tour of the city, one of many that we had already ran through in the course of this program. We were all wilting along, snapping photos where required and sitting on any public bench that gave us a chance for respite. The energy had gone out of us somewhere around Old Town, but it snapped back into place when we came up to the memorial of the Grey Man. 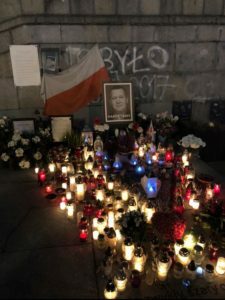 This is the unofficial memorial to Piotr Szczesny, who died after lighting himself on fire in protest against Poland’s Law and Justice party. 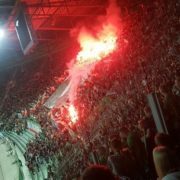 That was what Piotr Szczesny proclaimed himself as before he set fire to his body in front of the whole country. A year ago, as Poland, like every other country, started to feel the tug of a backwards pull away from democracy, this man protested his government. He stood in front of the Palace of Culture, a symbol of the once totalitarian communist regime that gripped Poland after the end of the Second World War, and handed out fliers containing his manifesto in which he decried the actions of the ruling Law and Justice party. He then calmly doused his clothes in gas and set himself aflame. Our tour guide does not tell this story. His words are choked out by tears before he could even start. 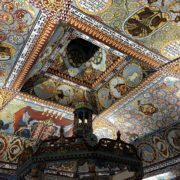 The Grey Man had proclaimed himself as such because he felt he represented the average Polish citizen. 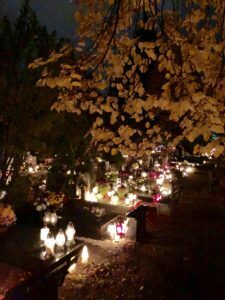 The grave lanterns that decorate his memorial for All Saints Day show that the people of Warsaw embraced him in his sacrifice. He died days after his self-immolation, but the country hasn’t yet decided if they agree on his definition of freedom. Remembrance is a five-thousand-dollar word on Syracuse University campus. Or, at least, the Remembrance Scholarship is worth something like that. I had first learned about Pan Am flight 103 when my freshman class routine was interrupted by the appearance of a monument set up on Syracuse University’s Quad. The expanse of grass in the middle of campus was covered in rows of white folding chairs. Each one bore the name of one of the Syracuse students who never made it home again in 1988. Those chairs had made me cry the last two years that I had seen them show up on campus. 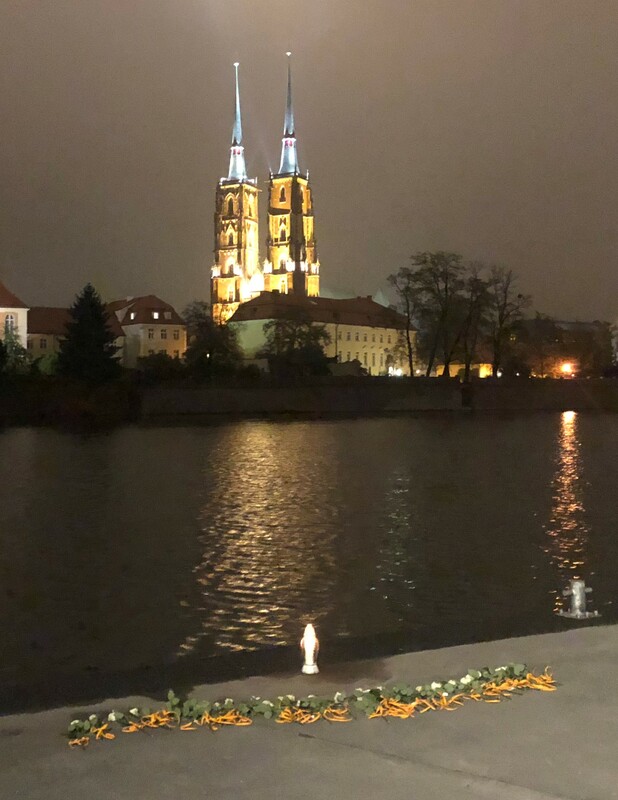 And, the thought of them is lodged in my throat while when we stood next to the Oder River waiting to lay roses during our own Remembrance Ceremony. Ours was an improvised imitation of the one performed every year at school, complete with our own little lantern to make it a Polish occasion. Our numbers are smaller than those who died in the attack. We each have two names to announce, and two roses to place. I chant mine. ScottMarshCorey, KarenLeeHunt, ScottMarshCorey, KarenLeeHunt. We had spent this long month of travel learning and remembering the pain of Europe in the twentieth century, and the many shapes it came in. From the victims of the World Wars and the Holocaust, to the victims of fascism and totalitarianism in every form, it felt like we had covered it all. But now, I actually had a name, or two, to put to a tragedy. At the Remembrance Ceremony, white roses were laid on the bank of the Oder River, around a small, white lantern. The scene overlooks Cathedral Island. 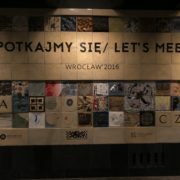 Standing there in Wrocław in the freezing cold, memory does not feel like an intangible thing. I feel like I have to brush the history of the grief I’ve learned out my hair every night, like I have to wipe it off of my shoulders. I have seen so many memorials over the time of this trip, that I feel like I am becoming one. And maybe that’s the point. Memory is just storytelling. Whether we just tell it to ourselves, or carve it into a statue, or pass it on from person to person, it only exists as long as we keep practicing it.